We often feel like we really know each other through our blogs and yet most of us have never met face to face. And, really, when you make friends you have them over to your house. You show them your stuff and you sit and chat. Since you can’t all come over to my house, we’re going to try it this way. I is for Inside My House. Hope you like the looks of things! This is my kitchen. We did this about 9 years ago and I still love it. 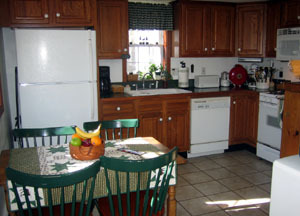 While I’d like to replace the countertop with granite, I do love the green color of the formica. 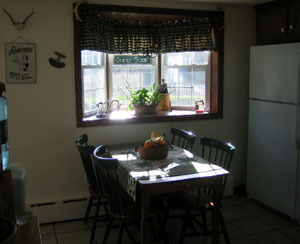 The bay window lets in lots of light and air as all three windows open. And that kitchen table belonged to Dale’s grandmother. I roll out my pie crusts here and feed my family. And I like to think of Dale’s grandmother hovering over and making sure I’m doing it all right. 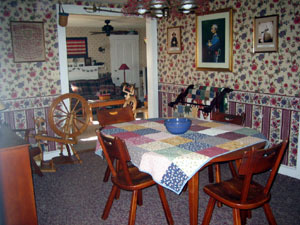 The dining room is central to most of our other rooms. The kitchen, living room, bathroom (only one, sadly), mud room and computer room are all off the dining room. The table and hutch belonged to my nana and it’s Rock Maple. Heavy stuff, that. And not really my style but I’m stuck with it. Yes, I made the quilt on the table. That’s actually the backside but I like to flip it over now and again for a bit of variety. And the piano mostly just sits there looking pretty but I can play. 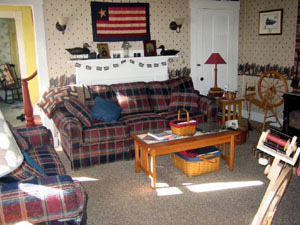 The living room is where we all hang out to watch television. It’s also where most of the knitting and spinning goes on! That big Longaberger basket under the coffee table holds my current knitting projects! 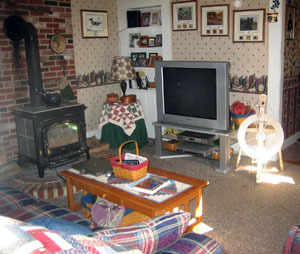 The wood stove keeps up cozy and warm and the artwork is mostly by family members. So, here’s the bedroom. We searched high and low for that wrought iron bed and finally found it at L.L. Bean about 2 years ago. It’s one of my favorite pieces of furniture that we’ve bought. I made the quilt. 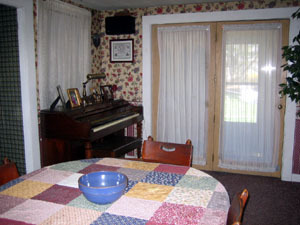 And the drapes, too, because it’s so much cheaper to make them than buy them. There are other rooms, of course. Three bedrooms upstairs and the office which we recently wallpapered. But, I’m not showing you that until it’s finished and we’re not quite there yet – we still need a rug and a curtain. I hope you’ve enjoyed this tour of Maison Carole Knits. My house is old! The rooms are small and the walls and floors aren’t very straight. But it’s cozy and safe and there’s lots of love inside those rooms. If you’re ever in the neighborhood, I sure hope you’ll stop by fer real! Your home is so cozy. I think we have the same TV stand. 🙂 I like your quilt. Thanks for the tour! Wow, grrlfriend do we live in different places. 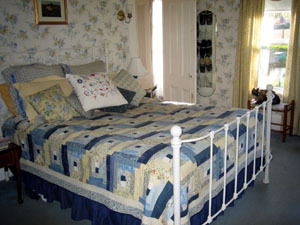 Please tell me you took time to pick up and clean up before taking pictures…all the rooms look so neat! Thanks for the grand tour! Your home looks so inviting. We’ve been looking everywhere for a wrought iron bed, too. I’m being so picky about it! Thank you for the tour! Your home looks warm and cozy and inviting. I’d be tempted to do the same thing for my I, but for one thing, I still haven’t done H, and for another thing, the amount of cleaning I’d have to do to be able to take pix of my apt that I want to show to other people? I don’t even want to think about it! I love your ‘I’. So personal! I loved taking a tour of your home! It’s so warm and inviting. Thanks, Carole. Thanks for the tour, Carole! It looks like a very warm and comfortable home. Thanks for the peek Inside. 🙂 It looks very cozy Indeed. Your home is lovely. And wow, so neat and tidy! I love the quilts. Oh and your kitchen is so homey. yay! i love it! it is warm and inviting. i want to plop myself down on that couch and have dale serve up some beer. ha! and your quilts are beautiful. Very nice, thanks for opening your home to us! I so miss the woodstove from my childhood home. Such a wonderful warmth…. Thank you for sharing your cozy warm home with us. I know I’d love to live there! This is a wonderful “I.” And I can attest to the warm, loving feel of your house. Just like you and Dale. It is such a comfy place filled with things that you love that reflect your interests. Carole, that was a wonderful idea. Thanks for the invite and tour of your lovely warm home. Your home is very cozy and comfortable looking. I can imagine stopping by and just hanging out in the kitchen. It’s all very cute. Heh. What’s a straight floor? How inviting your house is! A lovely tour, thanks! Aw, Carole, I love it! Great “I”! I love all the quilts. Thanks for having me over!!! I’ve been in my house for 6 years and STILL haven’t done any decorating. I stink at that. Next time, let’s do dinner! Great “I”, Carole … and I really like your house. The kitchen and living room in particular look like great places to hang out. Love your home! I feel like I really did come over and visit. Plus, it’s so clean! Oooo, thanks for inviting me over 😉 Your house is lovely and I adore getting to see people’s homes as it gives you another view of who they are and what their tastes are. Just like I remember ;o) Great post! Thanks. I’m a sucker for house tours. Wow, you made the quilt and the drapes?! Thank you for inviting me in! I love your house. I’m a truly crappy housekeeper, so I rarely invite anyone over unless they know me well enough that they aren’t disturbed by our chaotic pig sty. Keeps me from having to straighten up for casual visitors. Heehee. It looks so warm and inviting! I love all the quilts! I’m pretty sure I don’t have to do this sort of post. Old news, and all. I love your kitchen, and I’m a big fan of Formica. I’d take it over granite any day. I am enchanted by your house (and all the quilts and the spinning wheel and the flag over the firplace and the wood stove)! Carole, thanks for the great pictures of your house. I love that it is soo full of light and memories of your family. Oh, your house is so clean and clutter free! I feel as if I have been there. No really. I do. What a cozy, happy home! You know, my comment was going to how cozy your home is and how obvious it is that there is love and history…and then in your last paragraph you say more or less that! Too funny. It’s wonderful that you have family antiques! I love this glimpse of you througuh your house. Thanks for the tour! Can you tell I am behind in my reading….LOL? I LOVe your house……so cozy looking (and neat)! Did you make the quilts yourself?